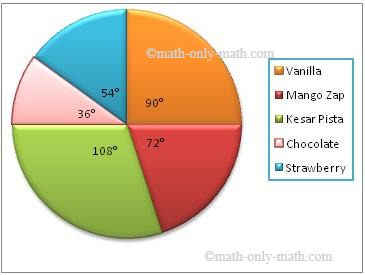 Now we will discuss about the construction of pie chart or pie graph. In brief let us recall about, what is a pie chart? ● Various observations of the data are represented by the sectors of the circle. ● The total angle formed at the centre is 360°. ● The whole circle represents the sum of the values of all the components. 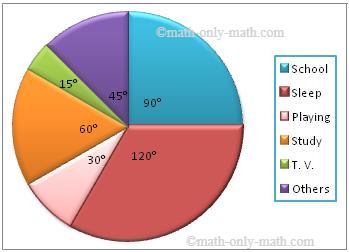 How to construct a pie chart? ● Find the central angle for each component using the formula given on the previous page. ● Draw a circle of any radius. ● Starting with the horizontal radius, draw radii, making central angles corresponding to the values of respective components. ● Repeat the process for all the components of the given data. ● These radii divide the whole circle into various sectors. ● Now, shade the sectors with different colours to denote various components. ● Thus, we obtain the required pie chart. 1. The following table shows the numbers of hours spent by a child on different events on a working day. Now, we shall represent these angles within a circle to obtain the required pie graph.